This guide will teach you how to improve your play in small pot tournament poker. It is meant to keep you in the tournament by not over inflating pots through betting too much, too early. The strategy we outline here helps you to maximize your river value bets by disguising your strength, while also allowing you to get away from traps and re-raises with the least amount invested. 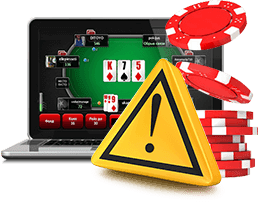 Our betting guide will allow you to take control of a hand, preventing pots from getting to the point where you are all-in before you need to be. How many times during the first couple levels of a tournament do you see someone raise 10-20 big blinds (BB)? Blinds are 10/20 but someone raises to 250 in middle position with no limpers or any action in front of him. Two people call and all of a sudden at least one of them is busted out of the tournament. The person who initially raised to 250 made the outcome of this hand inevitable by over inflating the pot too early in the game. 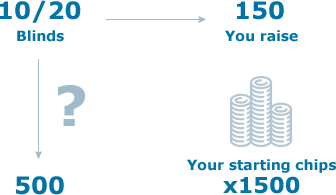 Understanding why you raise is straightforward, but how much to raise is a skill that most people never master. This is where management of your tournament stack becomes essential. The raise is a declaration of power in poker. It is the declaration of war against the table by saying my hand is better than yours. When you raise you want to push out the weak hands so that you increase your odds of winning the pot. You also want to invest money when you think you have the best hand. Who is going to call a larger than normal raise? Another powerful hand of course! Pocket KK will see AA at the showdown around 17% of the time. After all, who else is going to call all the betting but another good hand? The bet has to be large enough to make the pot odds incorrect for a caller. This is called the compound effect. In a tournament every chip matters and you cannot afford to waste a single one. Why? You have to keep ahead of the increasing blinds. Bets are made based on the size of the BB. Every time the blinds go up, chips become worth less relative to the big blind. Think of being in the middle of a large tournament with a stack of 3,000. The blinds are 75/150 so you have 20 big blinds left. Now the blinds go up to 100/200 and now, without your stack changing in size, you now have only 15 big blinds left. Your chip stack has lost 25% of its value relative to the BB. The bet needed to win a hand also increases as the pot gets larger. The bet has to be large enough to make the pot odds incorrect for a caller. This is called the compound effect. An overbet preflop will compound how much you have to bet postflop. As the turn and river are put out, the pot will get bigger and you will have to bet more to win it. The compound effect also works for the amount a player has to re-raise to get you off the pot. If you are betting half the pot he only has to triple that to make a decent raise, but when you bet the whole pot the only move is all-in unless you have a deep stack. The standard raise, if you are the first one into a pot, is a 3 BB raise. You need to increase this amount if there are limpers in front of you. You should add 1 BB for every limper into the pot in front of you. For example, the blinds are 100/200 and there are two limper in front of you. The bet should be 1000 (3 BB) = 600 standard raise + (2BB) = 400 for the limpers. You want to bet enough to force weak hands to fold, but not to prevent one or two callers. This creates isolation and helps you make money by increasing the odds that you will have the winning hand. By doing these standard raises, you are not investing more than you need to accomplish your goal. You can fold easier if someone goes over the top because you’ve only invested 3 BBs. You are also decreasing the amount that someone will have to bet to go over the top of you. This will make it easier to call any re-raise and stay in the hand. It is the early stages of a large tournament and you are at a full table with 10/20 blinds. You still have your 1500 starting chips. You get AJ in late position and are first into the pot, so you raise to 60. The button then comes over the top for 200. You can now let it go easily if you choose since you are only going to lose 60 chips. You can also call since 200 is not a huge portion of your chips. If you don’t hit, you can fold and still have plenty of chips to keep playing. Using the same set up as before, you are dealt AJ in late position and try to steal the blinds. You don’t want any callers, so you raise it to 150. The button then comes over the top of you. Now the re-raise will have to be around 400-500 to try and push you off the pot. The button can’t just raise it to 200 anymore. You have just forced this hand into a larger pot than it needed to be. You are now forcing yourself to fold because you don’t want to risk 1/3 of your chips with the call here. If you call here, the pot is now almost 1,000 chips. A pot size bet is the rest of your stack and a fold now leaves you with only 2/3 your original stack, and we are still at the first blind level. You will have to play tighter from this point on to try and get your stack back up – not a position you want to be in. The all-in bet preflop is used in only a couple of spots. When you get under 10 BB, your only bet should be all-in (what cards you do it with is up to you). The other time is when someone re-raises and forces you to an all-in or fold decision. For example, you only have 15 BB left and make a standard 3 BB raise. What do you do when someone comes over the top and re-raises to 7 BBs? You now have a critical decision to make: should you fold, or go all-in? Do you see the value here of the standard preflop raise here and the compound effect it creates? You can fold in this situation and not be shortstacked since you will still have 12 BB. If you had initially raised to 5 BBs, you would have pot committed yourself without knowing it. By making the larger than normal raise, you will be shortstacked if you fold. There are 3 kinds of bets post flop. A small bet is a bet that is 1/2 to 2/3 of the pot. 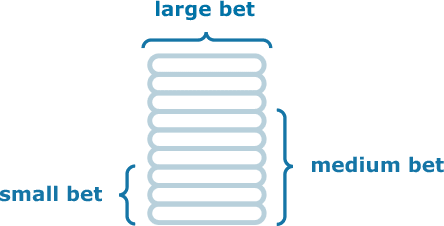 A medium bet is a bet of 3/4 of the pot to the pot size. And a large bet is any bet larger than the pot. 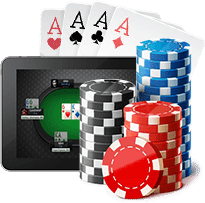 The first two bets are the most commonly encountered ones, unless the person betting is shortstacked. You have what you really want; just one caller in the hand. Small bets work well when facing one opponent. On a non-drawing flop, the proper bet should be 1/2 the pot. It is enough to announce that you are still in control and think you are ahead. If you do this consistently, it will make it harder for your opponent to tell if this is a continuation bet, or if you really did hit the flop. It also allows the pot to stay smaller if he comes over the top of you. Small bets all the way down also help hide any value bet on the river. If you bet the pot on the flop and turn, then bet only 1/4 the pot on the river, something will look fishy to smart opponents. If you are betting about 1/2 the pot after the flop and on the turn, the smaller value bet on the river seems a more natural bet amount. A medium sized bet is better on a flop that has a flush or straight draw present. The proper bet is a 3/4 pot size bet so it is harder for opponents to call and chase. You want to make it look tempting to call, but actually have priced out other players. You don't need to bet the pot to do this. You are actually extracting value if you get them to make the incorrect call. Loose players will look at the bet and say, "I am willing to risk it even if it is incorrect pot odds." The bet looks small because it is not a full pot size bet, or really close to it. Shorter stacks will push on a drawing hand to semi-bluff. You will then have to decide if it is worth the call. The smaller the pot, the less likely they will attempt the semi-bluff to begin with. First and foremost, bluffing is not recommended in a multi-player pot, even if you are in position. You more than likely are behind, and you shouldn't want to risk chips in a losing cause. More traps are found in these hands than in heads up because there is a better chance someone hit the flop hard. 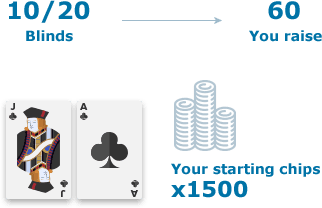 You don't need to risk a re-raise with a continuation bet (a bet where, after betting first preflop, you fire out another bet after the flop whther you hit it or not). 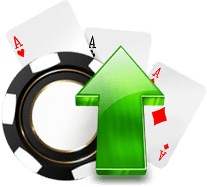 If you bet after the flop and someone calls, then you increased the pot with a small chance to really improve on the next card. You should try to take a free card and see if you improve. This will reduce the bet you will have to make on the turn if you want to take a stab at the pot. Think of the compound effect here. The trapping opponent just got more money into the pot and will make his move on the turn with a re-raise, and collect even more money. A medium sized bet here is good if you hit the flop. A 3/4 pot size bet is good enough to take most non-drawing flops down, or a flop that has only a flush or straight draw present. You want to bet enough to scare the draws, and make the under pairs and second pair hands pay to see the turn. If you don't bet enough, and everyone calls, the draws will get priced in. You need your bet to be big enough to start isolating, or just win the pot outright. The pot size bet is for flush and straight draw boards. You will have lots of scare cards here and will want to take the pot down right away. The all-in bet postflop is used as a scare tactic, as well as a double up move. It can be used to look like a bluff when holding a monster hand, or can force someone to lay down a marginal hand. The other time all-in is used is when the pot gets too big and it is your only bet left to make. The betting patterns you present when playing in a tournament are different from those in a ring game. Once you run out of chips you are done, so you have to be more careful about what you put into the pot. The betting amounts discussed here may not maximize every hand you win, but they will help you lose less. The above advice will also help you stay in a tournament longer. The longer you stay in a tournament, the better your chances are that you will hit that monster hand and boost your chip stack. Remember: slow and steady wins the race; fast and crazy is for roller coasters.